Central park is an oasis in the middle of the hectic city. You forget that you are located in one of the worlds biggest cities when you set your foot in this park. The park is situated in the middle of Manhattan between 59th St. South (Midtown) to 110th St. North (Harlem). Here you are in grean meadows, leafy piece of forest, lakes and even a zoo. The park is 4 kilometre long and covers 340 hectare. 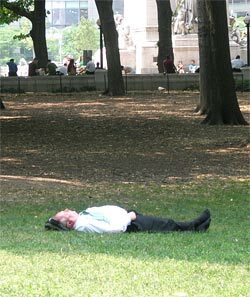 The park is a lovely environment for those who live there or are visiting New York. Here you can walk, jog, bicycle, skate, ride, dance, play volleyboll, have a picnic, yes.. just relax. The park was build after that Fredrick Law Olmstead and Calvert Vaux won a competition in design and 15 years and 14 million dollars later the park opened year 1876. At the summer time outside concerts are held here and in the winter time you can skate at Vollmar Rink, this thanks to Donald Trump that assisted with fundings to be able to restore the skating rink. You can gladly walk in the park, but keep in mind to be careful in certain parts were you are walking. Be sure to have a good map with you, then it can be easy to wander off in the park. The park is closed after nightfall, then it is forbidden to be there. In the park you can find this among other things. An outdoorscene at Delacorte Theatre (approx in the middle of the park), two skating rinks, one swimmingpool, a weathercentre at Belvedere Castle, an obelisk (the neddle of Cleoptra) which is the oldest public monument in the US. Here is also a fort, Blockhouse, in the north part of the park, it is from the war year 1812. The park has been in more than 200 movies and have been visited by several famous artist as Bruce Springsteen, Paul Simon, Elton John och Dave Matthews. Even the Pope held a mass here in 1995. Strawberry Fields (in memory of John Lennon). Dec 8, 1980 John Lennon was killed outside his home, Dakota Building at Central Park West and Norht east corner of 72th St. Across the street in Central Park you will find this memorial place Imagine in Strawberry Fields. The place was dedicated by Yoko Ono to her John Lennon and at this place fans are gathered and at the day of his death a moment of memory is held. The skate rink were you in wintertime can skate and in the summertime do inlines and roller skates. You find it in the south part of Central park, almost furthest down. 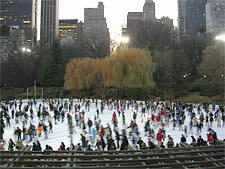 The Wollman rink was built in 1949 after a donation of $600,000 from Kate Wollman. When we visited New York in August 2007 they had turned the rink into an amusement park . The buildning was a Swedish school in the 1800s. The house was built in 1875 in Sweden and was a gift to the US before the world exhibition in 1876. 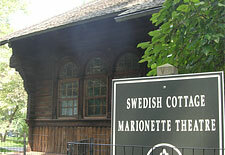 You will find it on the West side of the park beside 79th St. Today (2007) it is used as a Marionette Theatre.